Remember EcoShopper, the first attempt at online retailing that local mobile operator Econet made in the first quarter of this year? Well, it looks like this move into e-commerce is being followed up with something else. We have received information from an inside source to confirm what has long been said to be in the cooking at Econet – a classifieds platform called tengai.co.zw. The website isn’t up yet, but a look at some of the artwork related to it seems to show what we can expect from it. 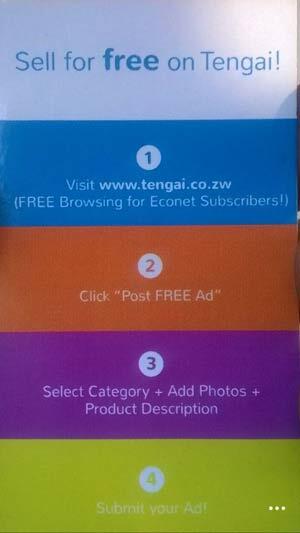 Posting an advert on the platform will be free, along with free browsing for Econet broadband subscribers. This becomes the latest move by Econet to double down on broadband-related services in an increasingly competitive telecoms market. The field of e-commerce, though taken a shot at by a handful of startups locally is yet to be cracked wide open. Ironically, the biggest online success locally has been with another classifieds platform, the Webdev owned classifieds.co.zw. Perhaps Econet has noticed the potential in that segment of e-commerce and wants to make its own mark? The name Tengai, which means “buy” in Shona, closely resembles 10ngah, the name of another Zimbabwean online retail platform. This new Econet platform will likely cannibalise the little brand equity 10ngah has built unless the two are working together. I have a feeling this could be BIG. With free ad listings + free browsing, Tengai seems like a v attractive proposition to would-be online sellers. Perhaps this will kick-start e-commerce in Zim! Any idea when the site will launch? Sounds interesting. Does that mean Econet will zero – rate the site? If so, i look forward to tryin it when they launch. Need to find stuff to sell now. This sounds great! Look forward to trying it out – when does it launch?! Techzim – I’m intrigued, are you sure this is from econet? Colour scheme, name and brand feel v different to me. Maybe you’re right but ill suspend my judgement until we get some official confirmation from whoever is behind tengai. Look forward to being enlightened. Also received an email from them. Aparently they are launching in partnership with econet. Maybe some kind of joint venture. Not entirely sure. Sounds like a good deal – free listing and browsing. Zero rate the site and you’ve got a guaranteed winner! You’re probably right. A lot of people refuse to use online services due to the cost of data. Zero-rating will surely get people online. If what you report is true, then I look forward to testing their service. Guess it makes a lot of sense for Econet to launch something like this considering e-commerce is driven by mobile browsing across Africa. If they make this work, Tengai should be a real game changer. when does it launch? i’m econet susbriber and have stuff to sell. anyone know? if they offer free browsing it will be very unfair, how will other platforms compete with them. They shud offer free browsing to all classifieds platform in zim. Not much different to shops that provide customers a toll free ordering phone number. Given the low level of Internet use in Zimbabwe I think it’s a good idea to zero rate the site to get people online. Econet could easily charge users data to browse and earn more revenue. You have a point but I think one of the main reasons why e-commerce hasn’t taken off in Zimbabwe is because users are concerned about data charges. Obviously telecoms companies can’t stop charging for data altogether (they need to make money), but zero-rating some services should get people to experience the benefits of online retail and hopefully start a new trend. If the reports about free browsing are true, I think Tengai could finally open up the e-commerce space. For it to be successful, they’ll need to educate consumers on the benefits which should have spillover effects for local e-commerce startups. Let’s wait and see – I’m hopeful that Tengai will be positive for budding online startup entrepreneurs. remember myspace? and aol search? Now we use Facebook and Google. If Tengai has a killer product, they’ll surely dominate the market in the future. Although I guess there’s room for more than one classifieds site in Zim. Look how many newspaper classifieds we have! Zero rating browsing on e-commerce portal is a great idea. Only worry is that if its partnership or JV, history may repeat itself repeatedly. Wake up one day there is no ecolife. Wake up next day, VAS patners dropped… this is the worry. Techzim – Do you know when Tengai is launching? Are they definitely going to make the site Zero-rated for all econet users? Wnt to try it!